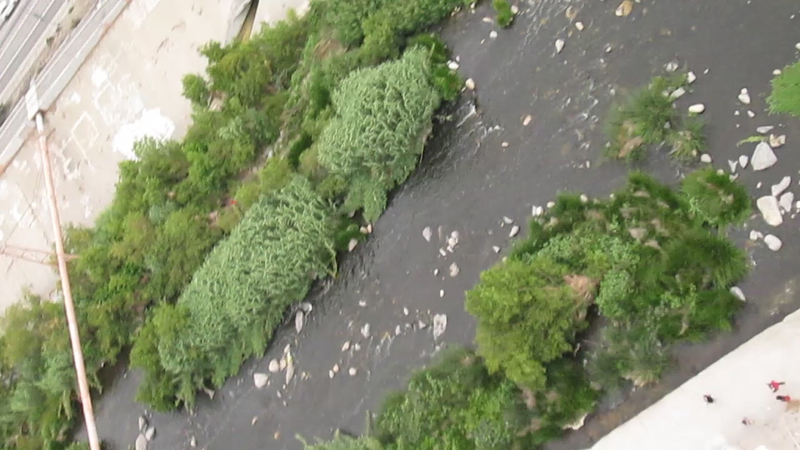 On May 24 2014, Lila Higgins, Kat Superfisky, Ken Grinde and I (Maria Lamadrid) flew a helium balloon over the Los Angeles River around the area known as Elysian Valley. This was our first attempt to motivate people and construct a high resolution map of the 51 miles of the LA River. Elysian Valley and it's 8,000 plus residents are part of a larger site area in the process of being branded as the Northeast Los Angeles Riverfront District (NELA) thanks to efforts that builds off the momentum to revitalize the Los Angeles River. The NELA effort is representative of increasing interest in the LA River based on the Los Angeles River Revitalization Masterplan (LARRMP), a 20-25 year blueprint for implementing a variety of improvements that would make the river one of LA’s most iconic landmarks. This represents a huge shift in rethorics: from hotspot for ecological analysis to community catalyzer. Multiple attempts are underway in the area to build a community supportive of the River along some of the neighborhoods surrounding the area (Attwater, Elysian Valley, Cypress Park, Lincoln Heights and Boyle Heights). However, many of the engagements with the community have been in extraction models to create a document that shaped community asks to developers. Our intention, as a group, is to embrace delight as a strategy, seeking to do more than measure a pulse and instead promote proactive community building. The day was slightly overcast and windy, which created some difficulties and blurry images. But right now the group is in the process of stitching a map from the resulting images and doing workshops to shape the initiative. Lilla Higgins and Kat Superfisky undertook a second balloon mapping session on early June, specifically of the Bowtie Parcel. More details on both the initiative and the second mapping session to be posted soon. I'd love to know what more has been done on this project and if any of you are in the LA area so I can learn more. Thanks! This project, sadly, has been put in the back-burner for now. The individuals participating in it have been swamped with other LA River-related initiatives. We are hoping to release the map and videos relating to it soon. Lila and Kat are dedicating most of their time to Play the LA River (http://playthelariver.com/) a initiative that seeks to bring all Angelenos to the river. I currently dedicate all my energies to co-leading an effort called Futuro de Frogtown (http://www.mas.la/futuro) seeking to mitigate gentrification in Elysian Valley (neighborhood at the heart of all the River revitalization efforts and the 1 billion dollar investment announced last year). I have done some other mapping in the area, such as building perceptual maps of the built environment and balloon mapping a piece of land called the Bowtie Parcel. If you are interested in any of the projects I have mentioned, please hit me up at info@mlamadrid.com and I will gladly share more or connect you with Ken, Lila and Kat.